Greetings again from the darkness. This is the 4th iteration I’ve seen of A STAR IS BORN. First there was writer/director William Wellman’s original version in 1937 which won the Oscar for Best Original Story, had 6 other Oscar nominations (including Best Picture), and starred Janet Gaynor and Frederic March (he playing a veteran actor and she a starlet). Next came the 1954 remake with James Mason and the fabulous Judy Garland (he playing a veteran actor, she an upcoming singer/actress). Both were nominated for Oscars, and the film was directed by George Cukor (10 years later would win an Oscar for MY FAIR LADY). 1976 brought the second remake (third version), this one starring Barbra Streisand and Kris Kristofferson. It won a Best Song Oscar for Paul Williams, and was directed by Frank Pierson, known best for writing the oft quoted line “What we’ve got here, is a failure to communicate” from COOL HAND LUKE (he also won a Best Screenplay Oscar for DOG DAY AFTERNOON). So perhaps it’s understandable that 81 years after the original, Bradley Cooper chooses this familiar story for a generational update and his directorial debut. When it’s announced that a new version of this story is being made, the obvious first question anyone asks is ‘Who did they cast?” Many were surprised when it was learned that Bradley Cooper had cast himself, and that Lady Gaga would take on the female lead. Sure, we all know Bradley Cooper as an Oscar nominated actor from SILVER LININGS PLAYBOOK (2012), AMERICAN HUSTLE (2013), and AMERICAN SNIPER (2014) … but can he SING? And yes, many had seen Lady Gaga in TV’s “American Horror Story”, but could she possibly carry a major film – sans heavy make-up and gimmicky stage gadgetry? The audience reactions are in. 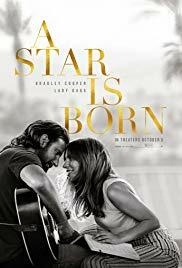 Bradley Cooper and Lady Gaga blow away the 1976 version, and where they rank versus the other two versions, comes down to personal preference. Mr. Cooper delivers an odd, yet effective, performance as the boozy, aimless rocker Jackson Maine. Not only does he mimic Sam Elliott’s speaking voice and cadence, his performance seems purposefully close to that of Kristofferson from 42 years ago. The great Sam Elliott does play Cooper’s (much) older brother, so the oratory choice makes some sense … it’s just a bit off-putting at first. Cooper is believable as the rocker thanks to his stage presence and charm. We never doubt Jackson Maine is a rock star. The most stunning and pleasant surprise here is Lady Gaga as Ally. For anyone who still thinks of her in terms of raw meat fashion at industry events, prepare yourself for astonishment. Her beautiful and powerful voice is on full display throughout the film. In fact, her songs and singing are the highlights of what is a terrific film that should have wide appeal. The first song she sings, “La Vie en Rose” (made famous by Edit Piaf) is quite simply jaw-dropping in its beauty. Ally is a pretty grounded woman from humble means. She works as a waitress and sings whenever she can … having been held back from pursuing her dreams by a well-meaning father (Andrew Dice Clay) who says she doesn’t have the looks to be a star. Ally has a Carole King “Tapestry” poster on her bedroom wall, and we soon learn she could probably sing most any song from that classic album and make it her own. When Jackson and Ally meet, a complex romance and professional partnership forms. We know those rarely end well. As Jackson shuns his protective brother, battles an ever-worsening hearing issue and a self-destructive drinking problem, Ally tries to remain loyal to the man she loves … even as her own career explodes down a path Jackson barely recognizes. In addition to the aforementioned Dice Clay (surprisingly subtle here), there is a musical duet with Marlon Williams (in the Roy Orbison tribute) and Presley Cash, and surprising supporting characters played by Dave Chappelle and Eddie Griffin. Probably not as surprising, Jon Peters is listed as a Producer on the film. If you are unfamiliar with Mr. Peters, he was once a hairstylist to celebrities and in the early 1970’s fell in love with Barbra Streisand. His first credit as Producer was for her film … you got it … A STAR IS BORN (1976). Mr. Cooper does a nice job tackling such a large scale and familiar project for his first directing gig, and we are certainly appreciative of his avoiding inclusion of Streisand’s “Evergreen”, and instead showcasing the talents of Lady Gaga. It’s likely Lady Gaga will receive a bit more credit for her acting than is probably deserved (an Oscar nom is possible), but her impact on the movie cannot be understated. Bradley Cooper’s next project as actor/director has been announced as BERNSTEIN, where he will play the great composer Leonard Bernstein. Kudos to Cooper for dreaming big! Greetings again from the darkness. Writer/director Woody Allen returns to the United States for his latest and examines a topic he knows much about … how to handle a public life that gets blown apart. Jasmine (Cate Blanchett) and Hal (Alec Baldwin) are living the extreme life of NYC power and luxury. It all crashes down around them when Hal is exposed and arrested as a Bernie Madoff type Ponzi-scheme white collar criminal, and Jasmine is tossed to the curb with no money or prospects. Disoriented from this whirlwind personal tragedy, Jasmine heads west to San Francisco to live with her sister Ginger (Sally Hawkins), a blue collar single mom. The sisters haven’t been close for a couple of reasons. First, Hal scammed Ginger and her husband at the time (Andrew Dice Clay) out of their lottery winnings. Second, they are both adopted and Ginger constantly claims Jasmine got the “good genes” so it’s expected that she gets the breaks in life. We quickly realize that Jasmine is bouncing between her fantasy of re-capturing her life of luxury and the harsh reality of her situation. She is not handling it well and falls back on things like going “back to school” to become an interior decorator. Additionally, she vocally disapproves of Ginger’s choices in men and poisons her thoughts that she (Ginger) can do much better than Dice or her current boyfriend (Bobby Cannavale). That leads to an expected turn of events featuring Louis C.K. While Jasmine is absolutely unpleasant as a person or character, Ms. Blanchett does a fine job of keeping us tuned in to this slow-burning breakdown. Her scenes with Michael Stuhlbarg are awkward and excellent. It’s impossible not to be reminded of Blanche in A Streetcar Named Desire, and even Gena Rowlands’ remarkable performance in A Woman Under the Influence (1974). Is Jasmine a monster who refuses to face reality or a severely damaged soul incapable of thinking clearly? Our opinion varies from scene to scene. The best and most insightful line of the movie comes courtesy of Ginger when she says “Jasmine has always had a way of looking in the other direction.” Her way of handling reality is to look away and pretend it doesn’t exist. The disgust at her sister’s working class environment and lack of empathy has us as viewers wishing someone would just slap her. Ms. Hawkins somehow manages to shine here despite the massive presence of Blanchett’s Jasmine. Woody Allen leaves us wishing we were all as strong as Hawkins’ character and thankful that we have no connection to a Jasmine.